The cities that have the most people living within three feet (one meter) of high tide — the projected sea level rise by the year 2100 made by many scientists and computer models — are in Florida, Louisiana, and New York. New York City, often not thought of as a city prone to flooding, has 141,000 people at risk, which is second only to New Orleans' 284,000. The two big Southeast Florida counties, Miami-Dade and Broward, have 312,000 people at risk combined. "Southeast Florida is definitely the highest density of population that's really on low coastal land that's really most at risk," said lead author Ben Strauss, a scientist at Climate Central. Climate Central is a New Jersey-based group of scientists and journalists who do research about climate change. The studies look at people who live in homes within three feet of high tide, whereas old studies looked just at elevation above sea level, according to work published Thursday in the peer-reviewed journal Environmental Research and an accompanying report by Climate Central. That's an important distinction because using high tide is more accurate for flooding impacts, said study co-author Jonathan Overpeck, a scientist at the University of Arizona's Institute of the Environment. And when the new way of looking at risk is factored in, the outlook looks worse, Overpeck said. And it's not just residents of coastal areas who will be hurt by this, said Sharlene Leurig, a senior manager for the insurance program at Ceres, a Boston-based investment network. Most coastal areas get flood insurance from the federal program and with more flooding, the program will have to spend more and that will come out of all taxpayers' wallets, she said. Sea level has already risen about 8 inches since 1880 because warmer waters expand, Strauss said. In addition to the basic physics of ever-warming water expanding, scientist say hotter climate will cause some melting of glaciers in Greenland and western Antarctica that would then cause seas to rise even more. 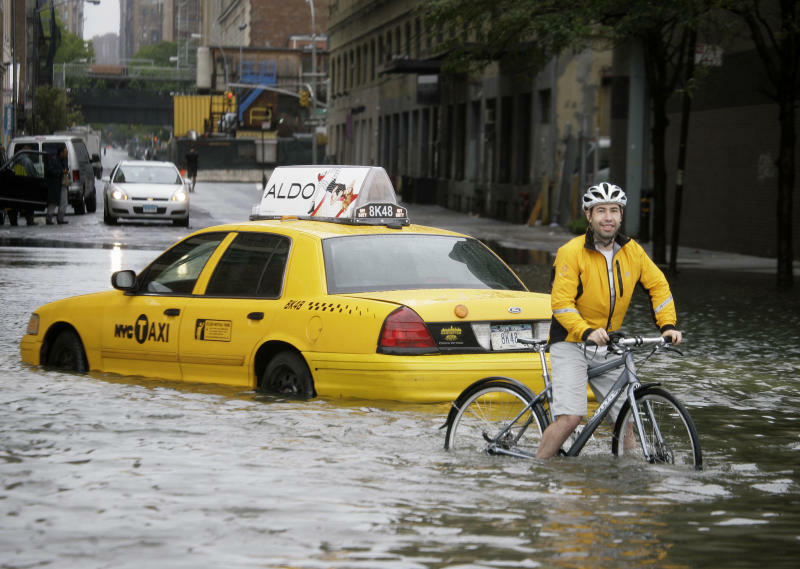 Flooding from Hurricane Irene last year illustrated how vulnerable coastal places such as Manhattan are with a combination of storms and sea level rise, Strauss said. Using data from the latest census, Climate Central also has developed an interactive system that allows people to check their risk by entering a ZIP code. Sea level rise experts at the U.S. Geological Survey and the National Oceanic Atmospheric Administration who weren't part of the studies said the results make sense and were done by experts in the field. "All low elevation places in the many urban areas along the coast will become more vulnerable," said S. Jeffress Williams, scientist emeritus for the USGS, who wasn't part of the studies. He pointed to Boston, New York City, Norfolk, Va., New Orleans, Charleston, S.C., Miami and Washington and its Virginia suburbs. "More people and infrastructure will be at increasing risk of flooding."